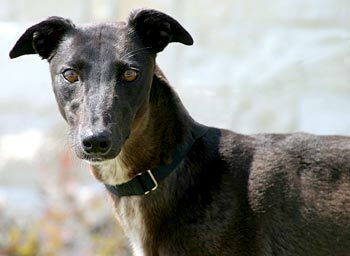 Lacy is a petite, 1½-year-old black female greyhound. 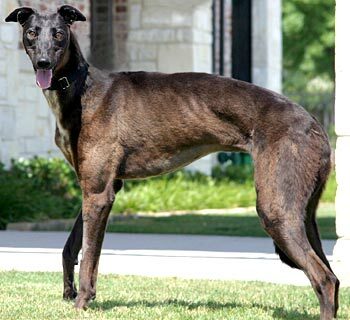 Lacy, along with Rain, was an owner surrender from the Amarillo area. The owner, who could no longer afford to feed them, said the girls are sisters. Lacy and Rain were given away by the breeder to the previous owner because they were black. GALT made the decision to separate the two so that each girl could let her individual personality shine. Lacy is the more reserved of the two, but, already being out from behind her sister’s shadow, she is beginning to blossom. She is a quiet, gentle little girl. She will stand willing at the kennel gate, but move to the back as you enter her kennel and stand quietly as you approach her. 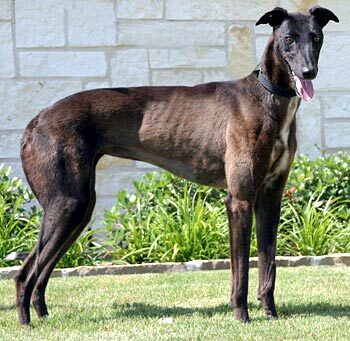 She loves attention and with confidence she'll continue to make greyt strides. If you're looking for a gentle soul, Lacy is the girl for you. Lacy wasn’t very interested in the cats. She got to meet three of them, one walking along with us in the house, another one sleeping at nose level, and another who tends to dart and hide from new dogs. Later when she was outside on a walk, a cat went along for the walk. She was perfectly fine with it. Rain’s excitement about the cat aroused Lacy’s interest in the cat, but when that influence was removed, she was once again calm and not interested.